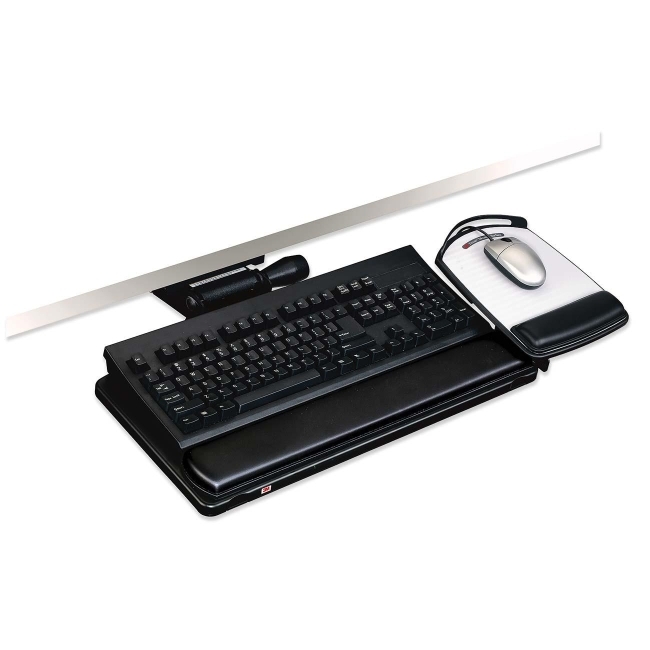 3M AKT150LE Adjustable Keyboard Tray - 23"
Keyboard tray with mouse tray offers an adjustable keyboard platform that slides left and right for optimal positioning. Features easy adjust arm with height and tilt indicators. Gel wrist rest has antimicrobial product protection that inhibits the growth of microorganisms. Height adjusts +6"/-4". Keyboard tray will work in standard workstations and corner workstations that can accept a 23" track. Compatible with ergonomic keyboards. It has a tilt range of +15/-15 degrees, 360 degree swivel and unlimited positions within height range. Mousing surface can be used to the left or right of the keyboard. Platform slides left and right over the keyboard, tilts forward and backward and adjusts up and down to the same level as the keyboard platform.